It may seem like choosing a paint gun for cars is an easy task. After all, as long as it’s designed for cars, it’s a safe bet, right? While that’s partially true, much more goes into choosing the right paint gun for the job. Here are some things to consider when purchasing an automotive paint gun. There are two main types of paint guns: HVLP and LVLP. Once you narrow down which type of gun you need, you can pay attention to other factors such as feed type and nozzle size. HVLP, which stands for “high volume low pressure,” are the most commonly used spray guns today. They are highly efficient and offer a controlled spray with little overspray. Some HVLP guns are powerful enough that they can be used without an air compressor, while others require a large air compressor to operate. Here at Auto Body Toolmart, we mainly sell HVLP guns for the professional market. LVLP spray guns, which stands for “low volume low pressure,” use less air volume than HVLP paint guns. These guns can be used with smaller air compressors and have fewer air requirements than HVLP spray guns. While deciding between an HVLP and LVLP is arguably the biggest thing you’ll want to determine, there are a couple other factors you’ll want to consider when choosing a paint gun. Feed - There are two types of feeds for spray guns: gravity feed and conventional feed. Gravity feed paint guns use less air pressure and are more efficient, but are more expensive than conventional paint guns. Conventional guns, which are also called “siphon paint guns”, are cheaper and carry more paint but are bulkier. Nozzle size - Paint gun tip size depends on the type of automotive paint you use. The thicker the paint, the larger the nozzle you will need. Larger nozzles are ideal for primer, while smaller nozzles are ideal for for specialized paints like single stage and metallics, as well as clearcoats. There are a number of paint gun brands out there, but here are just a few that we carry at Auto Body Toolmart. • DeVilbiss is a staple name in the world of automotive painting. Some of our top-selling DeVilbiss spray guns include the DeVilbiss GTi Millennium HVLP Kit, the DeVilbiss TEKNA ProLite Gun, and the DeVilbiss Finishline Solvent Based Value Kit. 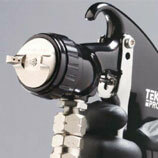 • The SATAjet 5000 B Paint Gun features an ergonomic handle and a digital pressure display to deliver excellent results. • 3M’s Accuspray ONE Spray Gun System is a lightweight, all-in-one painting system that eliminates the need for paint gun maintenance kits. It comes with four different atomizing heads for incredible versatility. • Anest Iwata is another excellent spray gun manufacturer. Top products include the Extreme Basecoat Gun, the Air Gunsa HVLP Gravity Spray Gun Kit, and the Supernova WS400 EVO. • The Sharpe Finex FX3000 HVLP Paint Gun is a great solution for high volume paint jobs such as car refurbishing. This gun has five different tip sizes available, as well as a mini version that’s perfect for touch-ups. • Air compressors are necessary for most spray guns. The larger the compressor, the more efficient it will be. • Air turbines are sometimes used to generate air for HVLP spray guns in the absence of an air compressor. HVLP turbine paint gun applications are more affordable than those that utilize air compressors. • Various paint gun tip sizes and nozzles are necessary if you plan on spraying a variety of paint products. • Replacement cups are essential as well. • Air hoses are used in conjunction with air compressors. Pay attention to specifications such as length and pressure levels when selecting an air hose for your compressor and paint gun. • We also sell paint gun maintenance kits that include everything you need to keep your gun clean and properly functioning. Various types of automotive paint. When it comes to paint guns, there is no singular ideal solution for every body shop. If you’re looking for a highly efficient spray gun, a HVLP paint gun may be your best bet. If you’re looking for a spray gun that will still deliver performance with less air requirements, a LVLP may work best for you. As with any body shop equipment, it’s important to be mindful of your workload, expectations and clientele when choosing a spray gun for your shop. When you’re ready to buy a paint gun, head over to Auto Body Toolmart and explore our wide selection. Our knowledgeable staff is ready to help you find one that will give you excellent results. Shop our paint guns and painting supplies today and please contact us with any questions you may have or take a look through our paint troubleshooting guide.